A portable box of teaching materials available to teachers in western Washington state high schools for two to six weeks at a time at no charge — also available online here. This large trunk contains lesson plans, four units (CBAs) of curriculum, posters, maps, artifacts, class sets of novels, books, and DVDs about Palestinian culture and the Israeli-Palestinian Conflict. All lessons are tied to state social studies standards. Tell us what you think! Tell us how you use it! The curriculum is also available online for free download. Just click on the Menu items to the left. 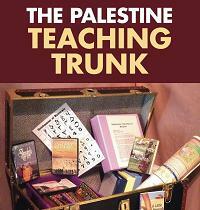 Here’s how some educators have described the Trunk: “comprehensive”, “develops critical thinking”, “makes it possible for students to hear silenced Palestinian voices, along with Israeli voices”, “exposure to both sides of the conflict”, “very useful to Social Studies teachers”, “diverse, well-chosen, nuanced materials”.